Google Shopping has emerged as the favorite of Pay Per Click Advertising. With product images & price comparison, it gives searchers most relevant information about the item they are looking for and a quick buying decision making process. 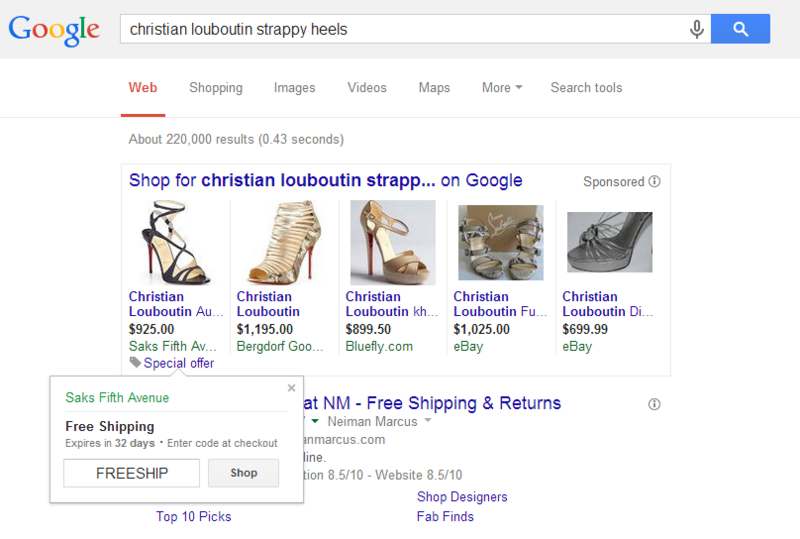 As much as 60% of Adwords product conversions are now generated through Google Shopping. Naturally the big guns at Google are aware of this, but not much has changed in last 3 years since Shopping has turned into paid PLA. In last few months Google released Merchant Promotions without much buzz, involved Merchants picked up on it quick and results are fast coming in fantastic. Here’s why I see Promotions as a winner long run. The World Wide Web is by its very nature constantly chancing & evolving. The shopping market online in recent years has changed, not only is it the easy press a button to buy and item lands at your door, but the shopper will be looking out for the deal, just shopping at market price is not fun anymore, hence the wild popularity of deal sites, coupon code websites and of course buying below cost price at Amazon where sellers keep loosing money along with Amazon themselves. What Google is putting forward now, is a reliable addition to it’s Shopping Engine where the shopper will not only get the best price comparison available, but also grab a discount code which always feels good. Unlike all the deal or coupon site where half of the coupons are dead or deal ended, here at Google they manually check every promotion it should be active so a Google Promotion will be a reliable item eventually catching up becoming popular with the people perhaps a must have to be a player on Shopping engines like Google. Just a few notes about the Promotional tool; you need to feel out the Promotion Interest Form to get the promotion approved, typically you will get a response within 24 hours. If your promotion doesn’t apply to all items you need to submit a Promotion Shopping Feed. Also Free Shipping by default is not promotion enough you need free shipping promo code in order to qualify but say get $5 off $50 will suffice even without a code. In the short time I’m using the promotion with my clients I’ve see great improvement in conversion rates. Shoppers are savvy and they will always look for a good deal. What remains to be seen is when or if Microsoft/Bing will catch on to it and add promotional tool to Ad center Bing Yahoo Shopping feed. Previous PostPrevious Does PPC listings affect your organic rankings? Next PostNext Does Facebook Advertising work?